Today Queen Elizabeth accompanied by The Duke of Edinburgh arrived in Ireland for a four-day state visit. Ireland is Britain’s nearest neighbour yet it is the first time, in her almost sixty-year reign, that the powers that be have felt that conditions are right for a royal visit. I watched the Royal Wedding last month; I enjoyed it immensely but I didn’t shed a single tear. I cried today as I watched The Queen stand in front of Áras an Uachtráin (Irish President’s official residence) and listen to a band play, God Save the Queen followed by the Irish national anthem. A moment imbued with significance and symbolism; peace in our time in this often troubled island. Recurring themes when people talk about the Queen are her strong sense of duty and her enormous commitment to a job that was thrust upon her at a very young age. I admire her for that. I loved the emerald coat and hat that she arrived in, surely a sartorial piece of diplomacy. She has a full schedule which sounds tiring, especially given she is now eighty-five and her husband nearly ninety. I very much hope she enjoys her visit to Ireland. 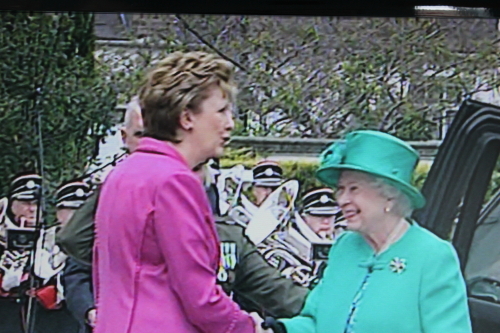 Note; the very blurry image above was shot from my television screen (RTE’s coverage of the Queen’s state visit to Ireland). Brava, B, on kind comments on Queen’s visit. She’s a dutiful, admirable lady, for sure. Can’t hold grudges forever for past English outrages against Ireland.